Pan Seared Red Snapper with Mango Salsa is an easy restaurant-quality main dish, which you can have on the table in less than 20 minutes. This healthy and flavorful red snapper recipe is perfect for a quick weeknight dinner, and, it’s also a show-stopping dinner party entrée. Fish is one of my favorite foods, and luckily, it’s available fresh year-round in Florida. I love all fish, but my favorites are grouper and red snapper. Like grouper, snapper has a lean, firm texture. Snapper fillets have a slight pink tinge and a mild fresh taste. A whole fresh red snapper is also a breathtakingly beautiful fish with its glistening red coloring and is highly prized by sports fisherman. I have a friend whose son is a charter boat captain in Destin. The last time I visited with her, she gave me some fresh red snapper fillets. I couldn’t wait to get home and prepare them, and I know you will agree with me, this red snapper recipe is a winner! Of course, if you don’t have snapper, you can also use any firm white fish like grouper, halibut, or even tilapia. What’s the nutritional value of fish? All fish including red snapper is high in protein, low-carb, and low in calories. Fish is also an excellent source of protein, potassium, selenium, and vitamin B12. A 4-oz serving of broiled red snapper comes in at roughly 100 calories. Easy Baked Parmesan Grouper Fillets. Here is a link If you would like to browse all of my seafood recipes. Fresh fish should have a mild briny scent and firm, moist flesh. Don’t purchase fish that has a strong, fishy odor or is mushy. So far I’ve only talked about the red snapper, and yes, it’s moist and delicious, but the crowning glory in this recipe is the mango salsa! Mango salsa like most salsas is flavorful, colorful and full of fresh and healthy fruits and vegetables. This versatile condiment brightens up the fish and enhances the flavor. 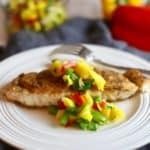 Pan Seared Red Snapper with Mango Salsa is an easy dish to prepare but does involve some chopping. The good news is that you can make the salsa up to a day ahead. There is only one caveat! 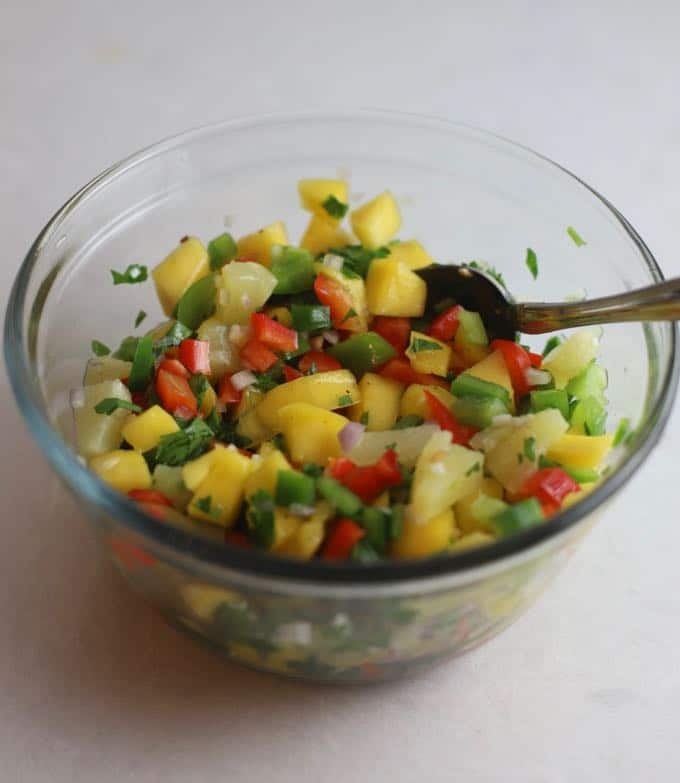 Mango salsa is so delicious; it might not last in your refrigerator until it’s time to serve it. If you have never worked with fresh mango, it can be a little daunting trying to figure out how to work around the large seed in the middle. If you need it, here is a link to a mango tutorial which shows a step by step process with pictures on how to prepare a mango. I confess, I only recently started cooking with mangos, and I wasn’t sure how to tell if they are ripe. On my last trip to the grocery store, I asked the produce manager to help me pick out a ripe mango. His advice was to first gently squeeze it. A ripe mango will give slightly, similar to avocados or peaches. Also, ripe mangos will sometimes have a fruity aroma at their stem ends. If you are unsure, ask for help. Now that you have a nice ripe mango chop the fruit. Then remove any seeds and ribs from the bell peppers and chop into small pieces. Remove the seeds and ribs from the jalapeño and mince finely. Peel and finely mince the shallot and garlic and chop the parsley. Add the mango, bell peppers, garlic, shallots, parsley, pineapple, jalapeno pepper, two tablespoons of the olive oil, lemon juice, red pepper flakes and salt and pepper to a bowl. Stir to combine. Cover and refrigerate for up to 24 hours. Season the red snapper fillets with Old Bay Seasoning, lemon pepper, and Krazy Salt and lightly dredge in flour. Shake off any excess. Add the remaining two tablespoons olive oil and butter to a large skillet over medium heat. When the oil is hot add the fillets and sauté 2-3 minutes per side depending on the thickness of the fish. When the fillet becomes opaque and flakes easily with a fork, it is done. To serve the snapper, spoon a generous amount of salsa over the fish enjoy. The mango salsa is fabulous by itself, and you can also use it as a topping for tacos, chicken or even as a dip. I like to spread a small amount of softened cream cheese on a toasted baguette slice and top it with leftover salsa. Voila, a quick, colorful appetizer that will have your guests thinking you spent hours in the kitchen. Equal amounts of kosher salt and garlic powder can be substituted for Krazy Salt. If your fillets are over 1/2-inch thick, increase the cook time per side by a minute or two. Additionally, if the fillets are 1-inch or thicker, you will have to place the skillet containing the fish in a hot 425-degree oven for about 4-5 minutes to finish cooking. The safe internal temperature for cooked fish is 145 degrees F when measured with an instant-read or meat thermometer. If you don’t have a meat thermometer, you can tell if the fish is done if the flesh has turned from translucent to opaque and flakes easily. **This recipe was originally published August 2015. Republished on March 6, 2019, with revised and expanded instructions and new photos. Pan Seared Red Snapper with Mango Salsa is an easy restaurant-quality main dish, which you can have on the table in less than 20 minutes. This healthy and flavorful red snapper recipe is perfect for a quick weeknight dinner, and, it's also a show-stopping dinner party entrée. 1.5 lbs Red Snapper fillets 1/2 inch thick or less, if fillets are larger see tips. 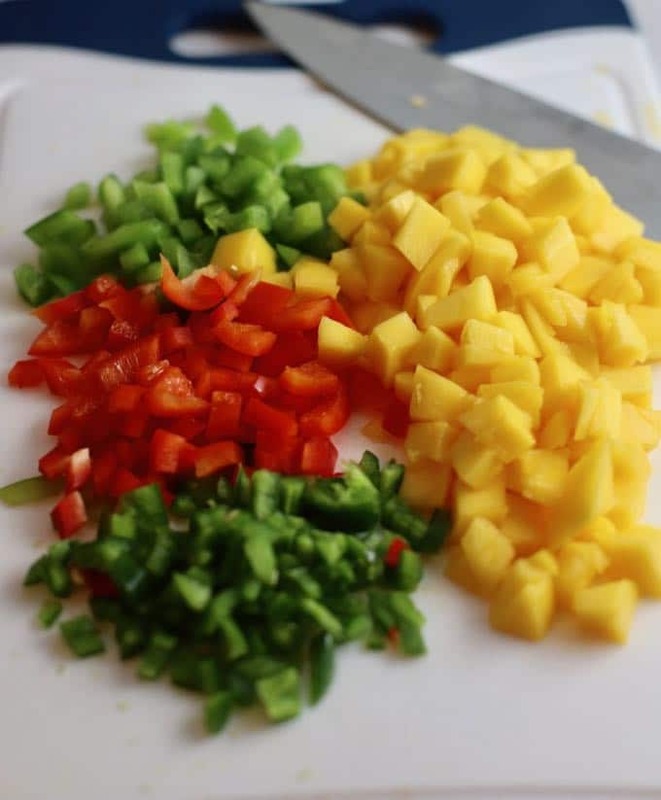 Add the mango, red and green bell peppers, pineapple, garlic, shallots, jalapeno, parsley, two tablespoons olive oil, lemon juice, red pepper flakes, and salt, and pepper to a bowl and mix well. Cover and refrigerate until ready to use. Season the fish with the Old Bay seasoning, Krazy Salt and lemon pepper. Dredge in flour and shake off the excess. Add the remaining two tablespoons olive oil and butter to a large skillet over medium heat. When the oil is hot add the filets and saute 2-3 minutes per side depending on the thickness of the fish. When the fish flakes easily with a fork, it is done. 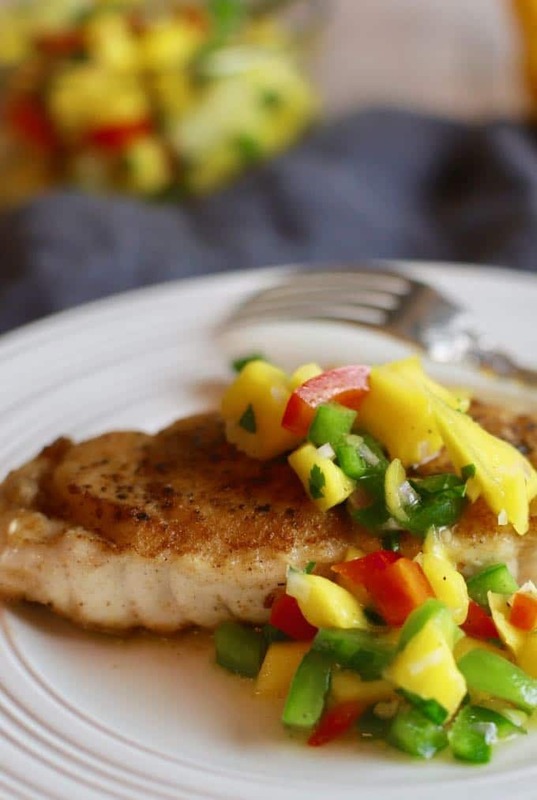 To serve, spoon a generous amount of mango salsa over the fish fillets and enjoy. 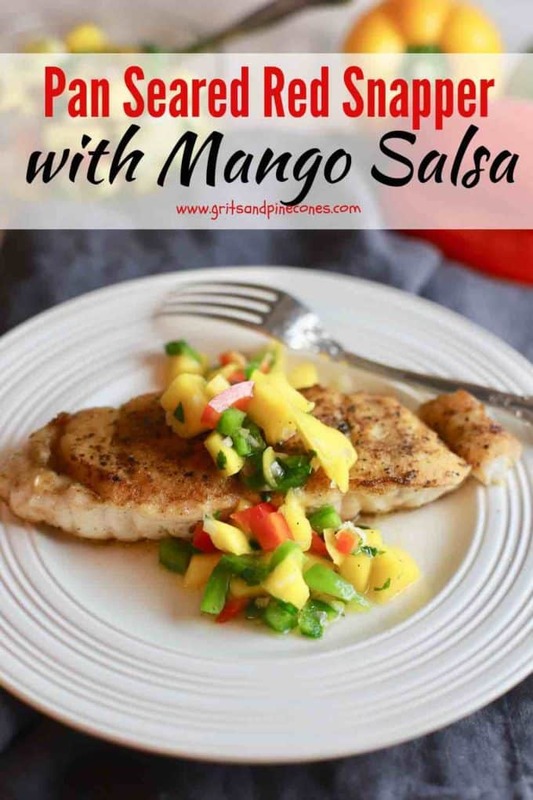 The mango salsa is fabulous by itself and you can also use it as a topping for fish tacos, chicken or even as a dip. I like to spread a small amount of softened cream cheese on a toasted baguette slice and top it with leftover salsa. Voila, a quick colorful appetizer that will have your guests thinking you spent hours in the kitchen. If you don't have Krazy Salt, you can substitute equal amounts of kosher salt and garlic powder. If your fillets are over 1/2-inch thick, increase the cook time per side by a minute or two. If the fillets are 1-inch or thicker you will have to place the skillet containing the fish in a hot 425-degree oven for about 4-5 minutes to finish cooking. The safe internal temperature for cooked fish is 145 degrees F, which can be measured with an instant-read or meat thermometer. If you don't have a meat thermometer, you can tell if the fish is done if the flesh has turned from translucent to opaque and flakes easily. This recipe sounds delish and will go in my file to prepare soon. I am loving your blog. We had the fresh red snapper with mango salsa tonight and fresh white acre peas, delicious! Added some sliced tomatoes, a great meal! I’m so happy you and Jim enjoyed the recipe. Your dinner sounds delicious! We actually had a similar one last night. Grouper with fresh white acre peas and sliced tomatoes! Great minds must think alike! Hope you guys are doing well and thanks so much for leaving a comment! I love all the recipes that you share Sharon. And this red snapper with mango salsa tops my “need to try soon” list. Looks fantastic with all the flavors joining together with the fish. I enjoy reading your posts with all the tips you give. Thanks for sharing.